As a little girl growing up in the country, I spent summers in the woods. Climbing trees, wading creeks and exploring. When I grew up and moved to the city, I left the woods, but the woods have never left me. Fortunately, I live only 50 miles from about a half-billion acres of woodlands in Great Smoky Mountains National Park. Even though it’s the most-visited national park in the country, it’s still plenty big enough to offer the peace, quiet and beauty that draw me to the woods. I go there to hike, my favorite combination of stress reliever and physical activity. Hiking is something almost anyone can do, and you don’t have to live near a national park to take advantage of it. Besides the Great Smoky Mountains, Tennessee has another National Park Service site, the Big South Fork National River & Recreation Area, along with 56 state parks. Those, combined with greenway systems in many Tennessee cities, make up almost 1,000 trails and walking routes accessible throughout the state. That’s a lot of opportunity to get out of the house, away from the office and into a happy place. There, parents can spend time with their children, friends can spend time together, but you don’t have to spend any money. Tennessee’s state and national parks are open seven days a week, year-round, and they don’t charge entry fees. Know the distance and degree of difficulty—most park or trail maps have labeled routes according to the challenge presented. Beginner trails are usually suitable for all fitness levels. Check the forecast—being unprepared for weather conditions makes for a bad experience. Even if the forecast is clear, it’s still a good idea to take along rain gear if you may be out most of the day. Footwear and gear—sneakers or athletic shoes are OK for flat, smooth surfaces, but more challenging terrain or hikes much longer than a couple miles call for comfortable and waterproof hiking shoes or boots. Apply insect repellent and sunscreen before hitting the trail, and dress in layered clothing suitable for the temperature. Food and water—plan to have snacks or food and water appropriate to the amount of time and distance you want to cover. A good rule of thumb is to bring enough water so that you can drink 8 ounces (one cup) for every 15 minutes you’re on the trail, and a healthy snack for every 60 to 90 minutes. Start short—beginners can easily overestimate how far they can go. It’s not only no fun to run out of steam mid-hike, it can be a health or safety risk. Know your limitations and those of anyone joining you. Start with an easy trail and limit the distance, to maybe 2 miles or less. Don’t go it alone—it’s best not to take chances on having a problem and no one to help. Those new to hiking, especially, should go in pairs or small groups. Take your cell phone—though signal is not always available in state or national parks—and let someone know when you expect to return. 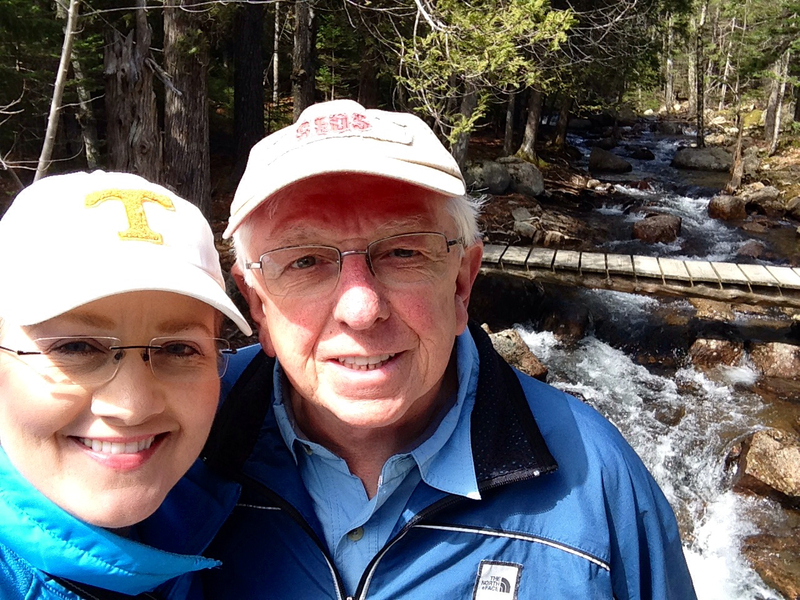 My husband and I really enjoy hiking and our relatively close proximity to Great Smoky Mountains National Park. 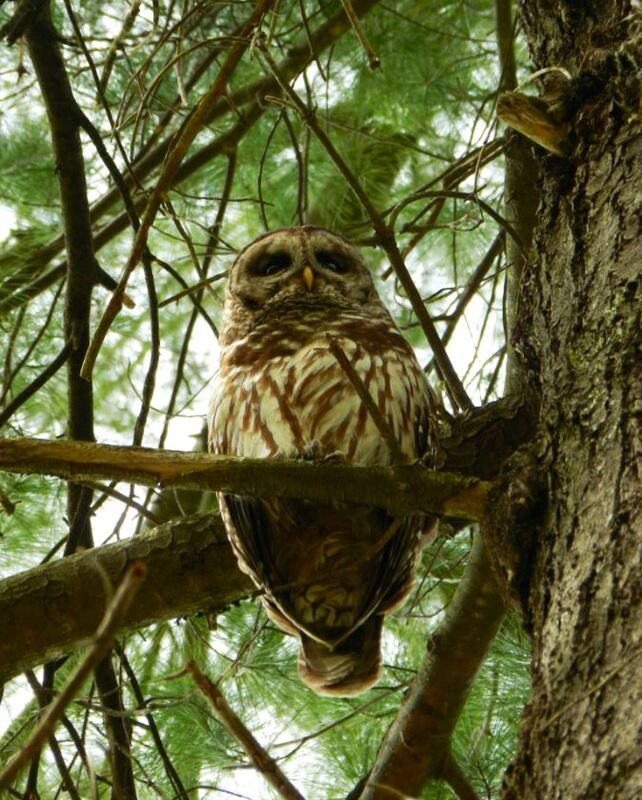 We go often with friends—hiking 600-800 miles a year—and you never know when you might make a new friend, such as this Barred Owl watching over us once as we passed along a trail below his perch.